Here's to a New Year - 2013! It's already the end of January but not too late for me to wish you a Happy New Year! We have so many exciting plans for the year ahead! We are finally going to open our farm to the public. We're fixing up the entrance to our workshop and making a little store here. I have a sign to paint - something I enjoy doing. It's beautification time at Honey Pie World Headquarters. No more living in a secret location for us. 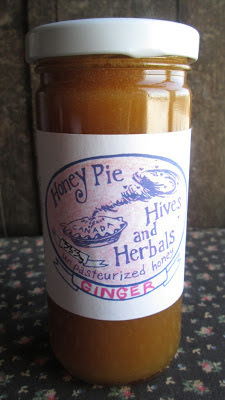 We will have an official Grand Opening in June to celebrate all things honey and herbs. Activities will include a wild herb walk and a herbal tea party under a tent. Mini honey pies will be served - hopefully by fairies or maybe children if we can convince them to dress up. Stay tuned for more details. Here's the winning photo from my photo shoot of my new greeting cards for our website. I got my favorite photos of honey bees on flowers made into blank greeting cards. They've been selling very well - I'm so thrilled! I'm looking forward to more following the bees around this year. I even made a calendar with the photos and sold out! This year I'll make the calendar a bit earlier in the year - I had it ready by the end of November but that was a bit late for some people. This is a shot of my calendar in our booth at the One of a Kind Show. January's flower is a white aster which has medicinal uses as well. It was a marathon show as usual but we had fun with it and posted daily photos of our outfits on our facebook page. We have two new flavoured honeys available. They are Ginger and Chocolate. They've been getting rave reviews and our always popular Cinnamon honey is starting to feel threatened. I've been giving out samples of honey at the farmers markets now that we're indoors and the yellow jackets aren't a problem. People are often confused and then amazed by the idea of flavoured honey. We don't use any flavourings - just ground organic ginger, cinnamon, cocoa etc. The moisture in the honey releases the flavour of the ground spice and it becomes tastier over time. I like the ginger honey in a cup of hot lemon and honey. I love this photo of Hazel playing the electric guitar. She really knows how to hang around all day in her jammies! When we're not hibernating in our pajamas we do a bit of sledding in Picton. This is a popular spot for sledding and pretty terrifying for all of us - in a good way. The thrill is intense.